The Champagnes from the house of JL Vernon have much to offer by way of delight and the cellar door in the centre of the village of Le Mesnil-sur-Oger is well worth a visit. Being Cote des Blancs fruit, most of these wines are sourced from Grand Cru vineyards. All bar the rose are 100% Chardonnay, blanc de blancs wines made by Christophe Constant. 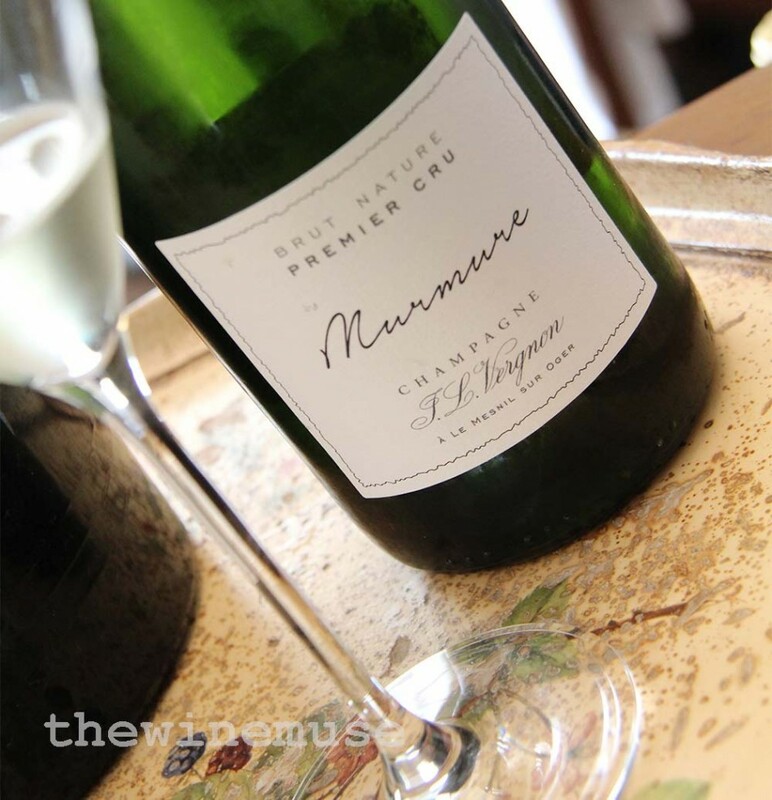 JL Vergnon Brut Nature NV Premier Cru Murmure : The zero dosage Blanc de Blancs alternative from the Cote des Blancs Champagne house JL Vergnon. With some of the base wine seeing some oak, there is an almond nuttiness to the pure citrus, floral and bready yeast expression of this wine. It is crisp and clean with a lightness of being, making it just right for an aperitif or a match with seafood and apertisers. JL Vergnon Brut NV Grand Cru Conversation: The Champagne that I tasted in May 2015 featured a majority of 2010 fruit from Grand Cru Mesnil, Oger and Avize vineyards and disgorged in July 2014. The Conversation is a richer mouthful with plenty of biscuity, nutty almond nougat and cream autolytic characters from more than 36 months on lees and 5 to 7 grams/litre dosage. The fruit underneath is floral, lemon and riper white peach. With a buttery palate and soft acid, this is a wine with something to say that is pushy in no way shape or form. JL Vergnon NV Extra Brut Grand Cru Eloquence : The Eloquence has some additional dimension to the fruit, but with a dosage of only 3 grams/litre. Some cinnamon, almond and lemon biscuit with an apple tart sweetness on the nose. The nutty nougat is long on the finish. 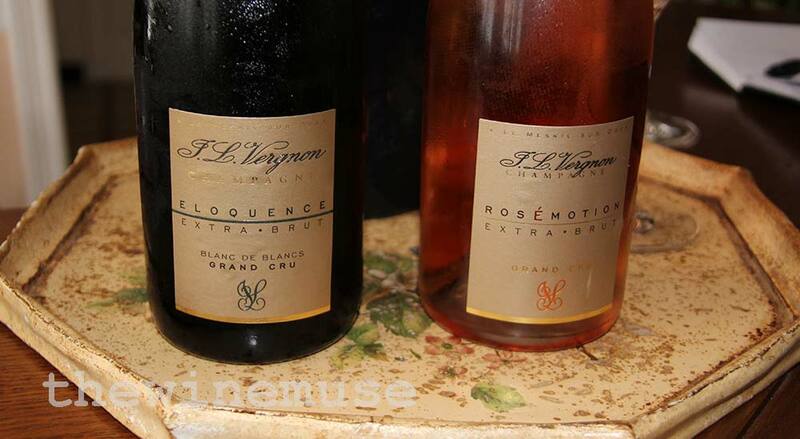 JL Vergnon Rosemotion Extra Brut: The addition of 10% Pinot Noir lends some berry depth to this Cote des Blancs Champagne’s citrus peach profile. There is some minerally limestone apparent as well. A creamy mousse with detailed fruit, it is crisp and fresh with a fruit weight that works well with food as well as it works without food. JL Vergnon Expression 2008 Extra Brut Blanc de Blancs: A vintage Grand Cru, the majority of the fruit is from the vineyards of Le Mesnil-sur-Oger in the Cote des Blancs region of Champagne from the excellent 2008 vintage. To keep the fruit pristine in this wine, it was fermented in stainless steel, unlike the worked up Confidence. Rich almond biscotti, creamy apple, lemon, cinnamon and ginger arise from the glass with an underlying limestone smoke. The creamy, soft texture of the mousse is complimented by the ripe, complex long toffee finish that does not detract at all from the crispness that leaves the palate clean. 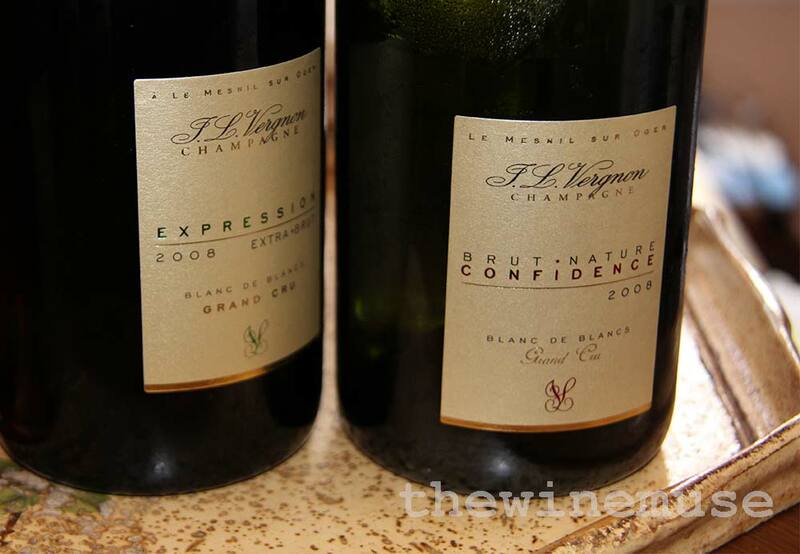 JL Vergnon Confidence 2008 Brut Nature Blanc de Blancs: This is a perfect foil for the stainless steel precision of the Expression 2008. Fermented in 400 litre oak, without MLF or battonage, over 4 years on lees, and zero dosage has created a Champagne with a richness that cannot disguise the ripeness nor the quality of the fruit from very old vines. Relying on the oak treatment to flesh out the palate rather than any added sugar has revealed an orange citrus, brioche, pale butter and spiced honey. The Confidence is full and generously bodied, finely detailed, yet linear with the soft acid driving the buttered toast long into the curvaceous palate. It is a versatile Champagne that is worth sitting over or eating with.